I wish I had the entertaining video to show you, but I attended the mini-musical that was this vehicle’s NY Auto Show debut…in 2016. Hampered by regulatory issues and battery constraints, this Outlander took 5 years to cross the ocean. But it’s here now and ready to provide Mitsu’s best-seller with an electrified option. How do they do it? They’ve placed a battery pack under the passenger compartment and connected it to 1 electric motor to drive the front wheels and a 2nd to drive the rear. Under the hood resides a 2.0-liter gasoline-powered engine which also doubles as a generator giving it the capability of directly providing power to the electric motors and to charge the battery pack. The brains of the operation decide which drive mode provides the best performance and efficiency. EV mode is exactly how it sounds – it’s an all-electric driving experience and as with all PHEVs, showcases the best of what the Outlander has to offer. This is how most of the initial driving is done when the battery is full. As the battery is used up or when you floor it, you’ll feel and hear the Outlander’s engine fire and then it goes into hybrid mode, with the motors now receiving their electricity from the 4-cylinder and the battery while also recharging it. And finally, the 3rd mode, which is most utilized during highway driving, predominantly relies on the gas engine to do the work. The Outlander is the only plug-in hybrid currently on the market that allows you to use these level III fast chargers. But they’re rather expensive and with limited electric range I’m not sure it’s going to make a ton of sense. With a fully charged battery the Outlander will deliver about 22 miles of all-electric driving in ideal ambient temperatures. In cold weather like this I’m averaging about 16. By the EPA’s math, that’s equivalent to 74mpg until the battery is depleted at which point you’ll average about 25mpg. That’s still better than the Outlander V6 though because of a much smaller gas tank, this PHEV has a comparatively lessened driving range of 310 miles. If you’re like the typical driver, this one will save you $1,000 per year in fuel costs as compared with the V6. Those savings drop to $300 per year if you cross-shop the Outlander’s base 2.4-liter 4-cylinder model instead. As I said before, the Outlander feels the most satisfying when the engine’s dormant, with prized EV attributes such as torquey quickness and cabin quietness. After that, it’s ho-hum at best with stained engine sounds and aloof steering. We have had some snow this week and Mitsu’s more sophisticated all-wheel drive system is the real deal and has proven to be a master of the white stuff. You can lock in all 4 wheels at any speed with this button here. I also like how the big paddle shifters are used to control the degree of regenerative braking and not faux gear changes; super helpful when driving in the snow. As for the output, there’re 80 horsepower and 144 pound-feet of torque max from each motor. It maintains the regular Outlander’s 4-cylinder tow rating of 1,500 pounds. Unfortunately the added 552 lbs it’s carrying doesn’t do the ride and handling any favors. Generally soft in its nature but unrefined, it drives heavy in the turns and a little bristly over rough pavement. Pricing starts at about $36,000 for the base SEL trim while this GT with added LED headlights, Rockford Fosgate premium audio, sunroof, a pair of AC outlets and techy safety features like the super helpful multi-view camera with conveniently placed button, comes in at $42,195. The Federal Tax credit for this one is $5,836 ostensibly dropping the price to around $36,000 before any further incentives. And if you find these side graphics to be a little too ostentatious don’t worry; you can leave that option box unchecked and save yourself $285. The Outlander’s cabin isn’t bad but this is an over $40,000 vehicle and Mitsubishi still doesn’t fully understand how to sweat the details. From the cheap exterior door handles to the driver’s seat that doesn’t feel fully bolted down, there are little reminders sprinkled about that Mitsu isn’t quite there yet in terms of quality. Because the Outlander’s lithium-ion battery pack is located beneath the passenger floor you can’t get this particular model with the 3rd row seat but thanks a lot Mitsubishi for still leaving the cupholders back here. The electronics are decent with CarPlay and Android Auto compatibility and an app that allows you to check in on charge status and control certain vehicle functions – though its necessary Wi-Fi connection is clunky and limiting. To their credit, no other non-luxury automaker is currently offering a plug-in hybrid SUV of this size. 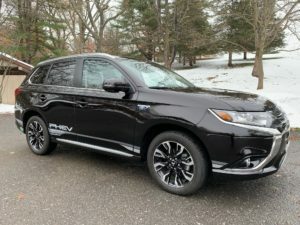 And if you’ve waited this long for one you may want to wait a little longer as the 2019 overseas model has been upgraded with a bigger engine and more battery capacity thus increasing its electric range to 33 miles but Mitsu won’t introduce these changes to the U.S. market until the Outlander’s redesign slated for next year.